MLM Compensation Plan decides how and when distributors will get compensation for the sales they generated. Some common MLM Compensation Plans are Binary, Unilevel, Matrix, Generation, Stair Step, Gift/Donation, and Hybrid MLM Plan. In this blog, we shall draw a comparison between binary MLM Plan and Unilevel MLM Plan. As the depth of the MLM network increases, it becomes increasingly difficult to manage the compensation and payouts. An MLM software can help in managing this issue and the overall network quite effectively. This is one of the easiest MLM plans to understand. In this Unilevel MLM plan, the distributor is free to recruit as many members as he wants to and all of them will be recruited in his front line. the same compensation ( commission) and the commissions are paid up to a fixed level to all the members at same level , depending on the company policy. Members receive the commissions up to 5 to 7 levels deep. The marketer who works in a Unilevel MLM network will get the following commissions. For recruiting new members into the network, a distributor will earn a bonus known as a Sponsor Bonus or referal bonus. Try out the Unilevel MLM Calculator and work out your compensation. A distributor in a Binary Network will get the following commissions. For recruiting new members into the network, a distributor will earn a bonus known as a Sponsor Bonus or referral bonus. When a new member is introduced into the network, say a binary network, and it will lead to balancing of the legs in terms of either the sales volume and the member of volume, then that particular distributor will earn a matching bonus. Calculate the compensations you would earn from a Binary MLM Plan with our Binary MLM calculator. Pay : Unilevel MLM plan pays up to a specific depth while binary MLM plan allows earning till unlimited depth. Implementation : Unilevel MLM plan is quite straightforward and easy to implement. The mandatory matching of the member volume in the legs lead to the complexity in the implementation of Binary MLM Plan. 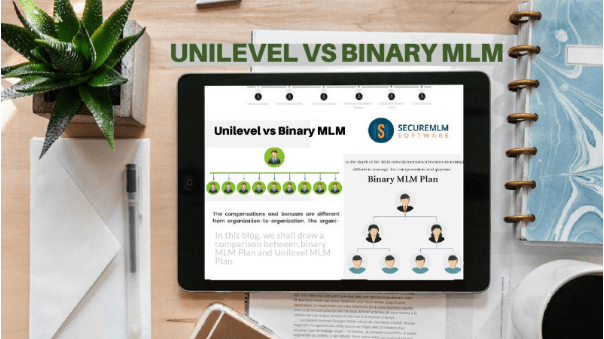 Downline expansion : The concept of spillover leads to the rapid expansion of the downline in Binary MLM Plan while this is not possible in Unilevel MLM plan. Downline structure : The unilevel MLM Plan has a quite simple downline structure while it is not the case in Binary MLM Plan. Downline Matching : Unilevel MLM Plan has no such concept of matching downlines while in case of Binary MLM plan, it is necessary to match the number of members in the left and right leg. Downline recruitment : In case of binary MLM Plan, there is a chance that individual extent of a distributor can influence the addition of new members in further down the downline to some extent due to the spillover concept. This is not the case in case of Unilevel MLM plan, where only a strong leadership skill can only influence the downline members to recruit more members. Teamwork : Binary MLM Plan thrives on the teamwork of the entire network while this does not influence the Unilevel MLM Plan.